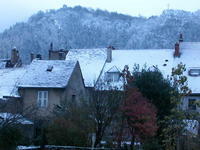 Kelly sent this great out-the-window photo all the way from Poligny, France. I took it a few days ago, she writes, but things look the same. Before the snow, the weather was bitter cold, with wind coming down from the mountains. Now, it's a cozy little chilly blanket laid over the town. Of course, it makes the fact that I brought heels here pretty ridiculous -- between the cobblestone streets and the slushy snow, I'll be wearing boots until March. Kelly, darling, I say screw the boots. Stay indoors. Put on a big sweater, high heels and fishnets, and eat Nutella with your fingers while gazing out the window. Till March. Ecch, nutella. Even before I became allergic to hazelnuts, I didn't like it: too damn sweet. Please pass the Valrhona. will be great to see you soon!